May 1st is Lei Day in Hawaii. It’s a day to celebrate Hawaiian culture through the lei. 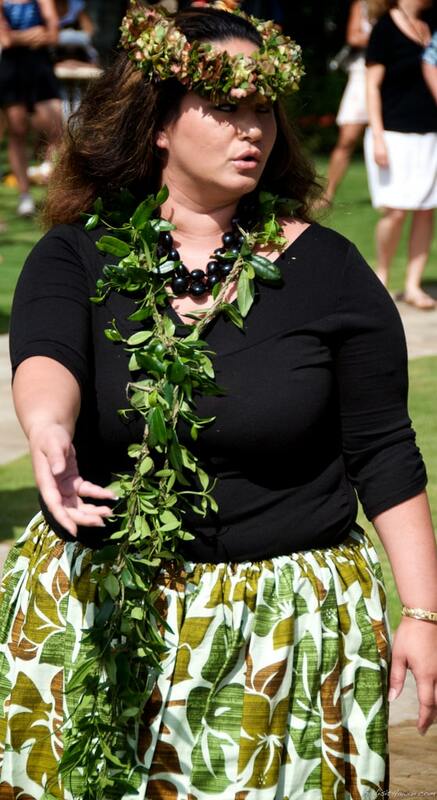 A Hawaiian culture expert by the name of Lopaka was on hand to tell about the significance of the lei in Hawaiian culture. We learned that the lei has much deeper meanings than what appears to the eye. A lei tells a story starting with the lei maker taking a voyage into the forest to carefully collect the flowers, berries, nuts, leaves and/or feathers. The lei maker then invests their mana (energy) to create a this symbol of affection. A lei is a symbolizes connection. As each flower is connected to the next, the lei represents the connection of the lei maker and the recipient. A lei can also symbolize the connection of family from elders to parents to children. On a larger scale, the lei symbolizes the connection the human race shares. A lei emanates the love of and awareness of the aina (land) and environment. A lei maker only uses what he or she needs. 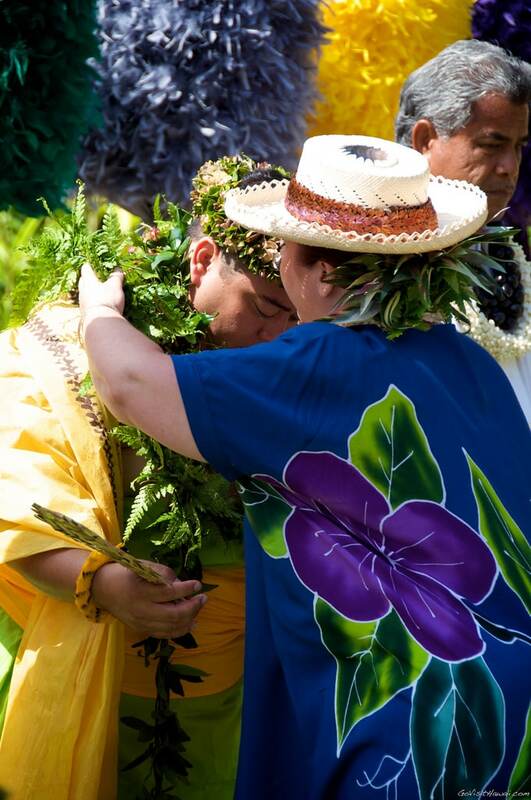 After the lei fades, in Hawaiian culture, the lei recipient would usually go to the ocean. Then, after some quiet contemplation, give the lei back to the environment. After understanding the deeper meanings of the Hawaiian lei, I appreciate them much more. 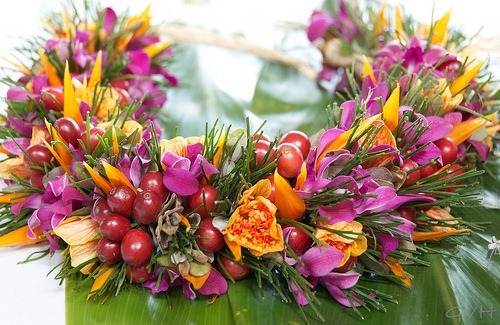 Have you been an honored recipient of a lei during your Hawaii travels? Every 1. May since 2005 I remember our Hawaii vacations in 2005 and in 2010. In 2005 we stayed at the Kapiolani Park, Honolulu and I was so impressed about the tradition. In 2010 we celebrated this day at Kalakaua Park, Hilo and there I got this deeply intense wish to learn Hula dance. During this week, we met some people for a spontaneous Tweet-up and there we have been honored with two beautiful Lei. Another Lei we received from our host at Kauai, and it was a Plumeria Lei, with white-yellow Plumeria. Our first Lei however we received at Old Lahaina Luau in 2005 and I took them with us until our last week at Oahu. There I brought them to the statue of Queen Kapi’olani leaving my deep wish to come back to the islands. My wish came true and hopefully we will come back to my beloved Hawaii next year! Aloha Manuela – mahalo for sharing your wonderful Hawaii vacation memories with leis. We share something in common — I also received my first lei at Old Lahaina Luau. I’ll keep my fingers crossed for you and Frank to return to Hawaii in 2014. Great information about the lei. I haven’t thought of finding its origin/significance until I read this post. Lovely photos. I have been there two times and not taken the time to understand the story behind the lei. Thanks for a great blog! where do u suggest i go as 1st visit please with my 2 kids and wife?